the Powdercap Traverse starts in the Brandywine Creek drainage and exits at Callaghan Creek you get pretty high and the views are vast. 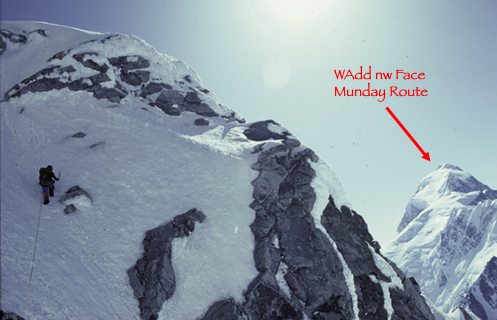 Here’s a shot of Randy Stoltmann coming off of Ring Peak. He was a excellent skier. What’s a Couple of hundred ducks? “A complex issue” environment Canada is quoted on a April 07 kill of 500 ducks on one of Syncrude’s massive bitumen tailing ponds. Seven months later no results. Why? It’s a no brainer eh? Syncrude is joint venture project with 7 oil companies and employs 5,000 people many of which are on a retainer or 20,000 dollars/year just to stay with the company. That’s a lot of money. In fact that’s 100 million. A proposed one million dollar fine for a small environmental glitch where you can actually see something dead in real time like birds is a pittance; As opposed to not seeing things dead immediately. Unknown are the results of long term exposure to toxicity levels in the Athabasca River flowing into the Arctic Ocean, or emmisions (Syncrude is Canada’s largest greenhouse gas producer and only 40k’s away from Fort McMurray) and damage to the Athabasca watershed in ground water and flow disruptions ( Syncrude uses 2.5 Trillion gallons of water a year thats about 760,000 bathtubs and water glasses annually, a third of the 2.5 million population of Denver,Colorado). We fight wars we see the dead immediately. The tar sands are a long way away out of the minds eye for most of the world but the effects are equally devastating. You just don’t see them right away. or the average Canadian toilet flushes 13 litres (way to much) thats about 847,000 flushes per day That’s as if the whole population of Quebec City + 100,000 got together and flushed each day. That heads into the Athabasca River Watershed and spews into the Arctic Ocean at Inuvik. But we don’t see it….its in the back of beyond the wilderness . Do we care? Will big mammals like the Beluga or Narwhal retain this in their blubber, Will the Inuit suffer, The ecosystem is being compromised now. All that science whether it was ecologically/environmentally viable should have done beforehand instead of going for greed as a common denominator. and lit a fire boiled water and first de-feathered the birds before de-gutting and stewing. By headlamp we chowed down our firs meat in days since our organic grown yak in Ghunza. Seems like people never learn. Winter mini rant ….. Its super cold for 2 weeks and guess what it doesn’t snow. Even outside on my porch at sea level I can see the hoar crystals build day by day. You know a warm front with lots of moisture is going to come eventually and override the frigid air … so it snows. The snow lays on the hoar now an unstable surface layer just like ball bearings. Then it waits for the trigger are you going to be the trigger? Sometimes the trigger can be a sound, a yell or a scream even. So can you imagine 8 snowmobiles in the rockies going into one of those big bowls with over 30cm overlaying ballbearings. Suicide man. Why are they there anyway? Whats the objective donuts or highmarking a slope, ….birdwatching? 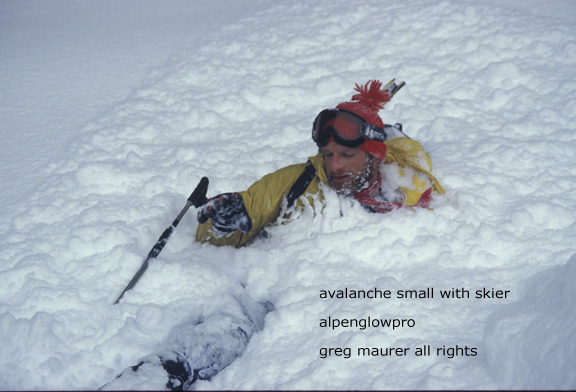 Although this is in the Himalaya and its seracs falling and not fresh snow you get the idea. You can’t get out of the way when its couple of hundred thousand ton mass is moving a couple of hundred k’s an hour even if you are on a snowmobile…. if you are on the sides you might have a chance but really its best not to be there. 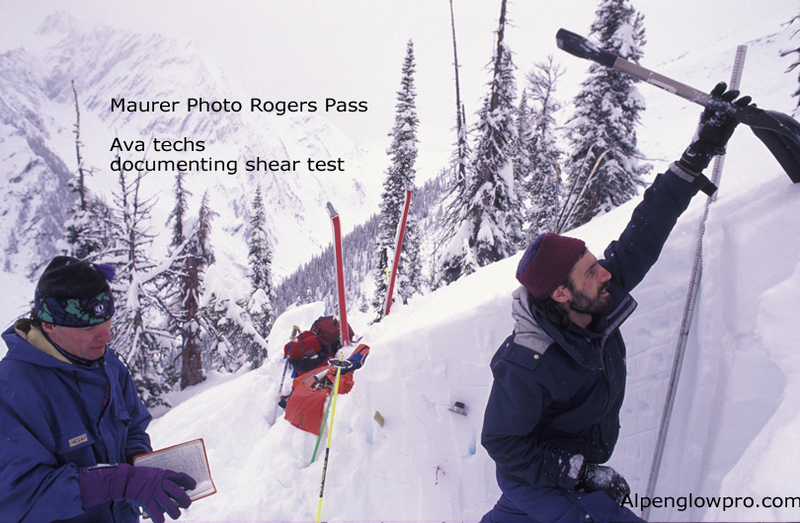 If you want to go this is what you do before…..these guys are ava techs at 2000 metres in Rogers Pass in the Canadian Rockies. 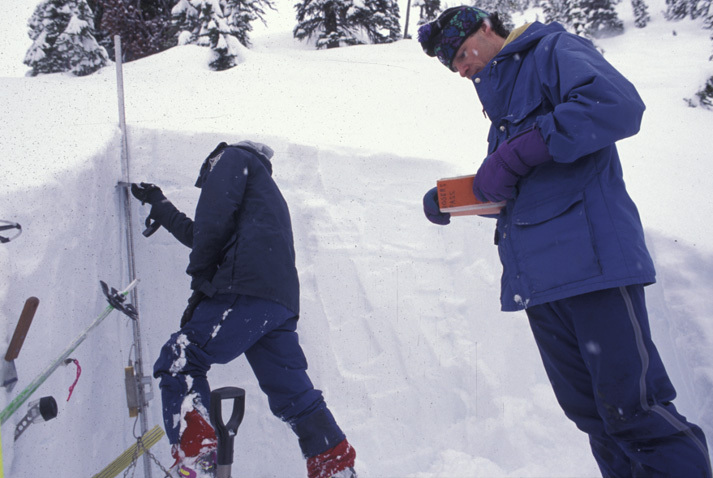 dig a pit, do shear tests, look at the crystals, note the weak layers then maybe go for it…….. So you know that feeling don’t you? When that wind pack is crunching underfoot under the labour of a heavy pack laden with rope, water, layers and at …… elevation. Well you can go outside right now its just after 7 am pst take a deep breath of life and get that same feeling and imagine the vista. Coastal BC December 20 08 high pressure minus 10c go make use of it take your camera and keep those batteries warm. This shot was in the high coast mountains around 200k airline nw of Vancouver Fury Gap a high pass in the Waddington Range Chris Spencer on the left Wadd on the right and Hickson in the back. You want to see mountains go there. Sylvain Saudan once said to me the the coast range is unparalleled wilder than the alps people in Canada do not realize the resource they have here wiki him.